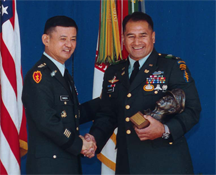 Chief Warrant Officer Nicholas Punimata is congratulated by Army Chief of Staff, General Eric Shinseki, upon receiving the General Douglas MacArthur award at a ceremony at the Pentagon on May 23, 2001. The award, sponsored by the U.S. Army and the General Douglas MacArthur Foundation, is given each year to company grade officers who exhibit extraordinary leadership abilities and embody the ideals embraced by Gen. MacArthur: Duty, Honor, Country. Gen. Shinseki himself was to exhibit those same extraordinary leadership abilities in 2003, just before the start of the Iraq War, when he testified before Congress that establishing control in Iraq after the invasion would require several hundred thousand troops. At the time of his testimony, he knew well that his testimony constituted a public break with the civilian leaders in the executive branch. Following his testimony, he was vilified and marginalized by those officials. His influence evaporated, and he retired in June 2003. Gen. Shinseki's testimony is an example of just what is needed to prevent both groupthink and pluralistic ignorance. The administration's action in marginalizing him, and possibly inhibiting any further comment by Gen. Shinseki or anyone else, is a clear example of the power leaders have to exploit both groupthink and pluralistic ignorance. Photo courtesy U.S. House of Representatives. In "The Perils of Piecemeal Analysis: Content," Point Lookout for December 17, 2008, we defined piecemeal analysis as a group process for analyzing proposals — a real-time process of discussion, most often used when the group is subject to stress and tight time constraints. We saw there how the content of the discussion can degrade decision quality, but the form of the discussion itself also creates risks. Here are just a few. Groupthink happens when the members of a group value consensus above decision quality. It's more likely to occur when there are social pressures against dissent, which is seen as a threat to harmony. In piecemeal analysis, when the leaders of the group begin to coalesce around rejection of the proposal, the rate of contribution of new objections can escalate so dramatically that proposers withdraw their ideas. But even if the proposer remains steadfast, groupthink can doom the proposal. Pluralistic ignorance is a group phenomenon in which anyone who dissents from an emerging consensus masks his or her dissent because of a belief that the unanimity of the group makes expressing dissent futile, and might even alienate the dissenter from the group. In this way, dissenters can actually be in the majority, while everyone believes the group is unanimous. Group polarization is the tendency of groups to adopt positions more extreme than the group's members would adopt if acting alone. Polarization happens because people feel less responsible for the group decision than they would if they made it themselves; because those with strong opinions can persuade the hesitant or dubious; and because people become more comfortable with the extreme when they realize others support it. The group decision process is thus susceptible to positive feedback effects. If the proposal was presented with some polish, it can contain a latent message that it is fully developed and free of inconsistencies, even when it is a mere suggestion. After uncovering a number of objections that have no answers, people begin to see the proposal as all flash and little substance. Moreover, during the objection phase, the proposer necessarily adopts a defensive posture, which can look weak and self-serving. A piling-on effect can occur. a defensive posturehas experience with piecemeal analysis, role choices are likely to follow prior alignments. For instance, given a second proposition from the same proposer, previous objectors and defenders are likely to step forward, in similar roles. In this way, the results of previous events leak forward into the current event, independent of their relevance or the merits of the proposal. Would you like to see your comments posted here? rbrenFrdptCtuRfqVYXCener@ChacusbJGVpaGeapAdJsoCanyon.comSend me your comments by email, or by Web form. I offer email and telephone coaching at both corporate and individual rates. Contact Rick for details at rbrenbcwYUkGTrjXefngoner@ChacHSlsQzTFQKoCwMctoCanyon.com or (650) 787-6475, or toll-free in the continental US at (866) 378-5470.